Is it just me, or do baby passerine birds always look sort of grumpy? This one looks like it’s glaring at me/the camera, which I assure you it wasn’t at the time I was taking the photo. I’d be surprised if it even saw me. I was probably 15 yards away. The adults sure saw me, though. 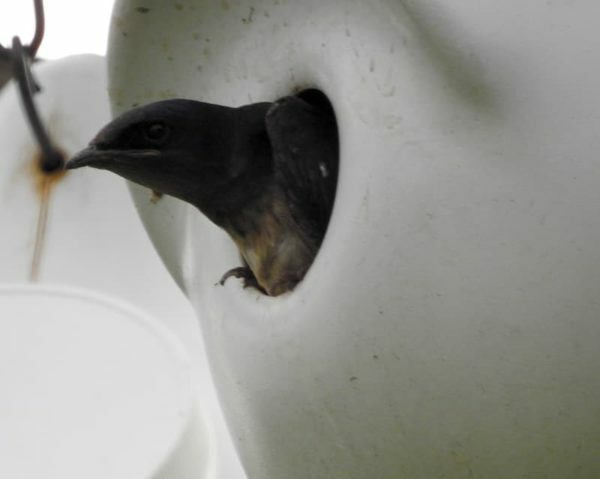 Purple martins are the largest swallows in the US, and since much of their natural habitat of sickly trees with large woodpecker holes has been destroyed in the East, the best place to see them is anywhere someone’s put up a purple martin apartment. The city installed one such apartment complex in our park, so you can always find the adults flying about on a summer evening. Well, these particular adults on this particular evening began making a racket with their peep-peep-peeps and chirps, and when 30 seconds passed and the baby’s parents failed to drop off more food into its hungry little gullet, I realized they were making the racket at me. I was standing too close, apparently. So I put my camera away and walked off, and they resumed their feeding. And maybe the baby relaxed and stopped looking so hangry. I’ll never know.